Spotify is getting into video, but Netflix has nothing to fear. The streaming music service plans to bring full-screen video ads to its free listening tier. 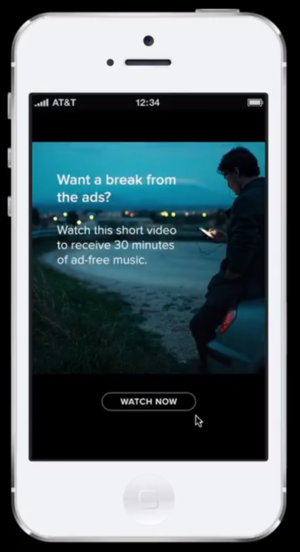 The new video ads will show up on the desktop and mobile, but smartphone and tablet users will have the opportunity to swap up to 30 seconds of their attention for 30 minutes of ad-free music. The new ad formats are slated to debut between October and December, according to AdAge. The first round of video ads will be with a limited number of advertisers such as Coca-Cola, Ford, and McDonald's. Just like other forms of adverts, video ads will only show up for Spotify users who don't have a monthly subscription to the service. Each video ad spot will last either 15 or 30 seconds, but will have slightly different formats depending on whether you're listening on the desktop or mobile. Anyone listening to the free version of Spotify on the desktop will experience video takeover ads. 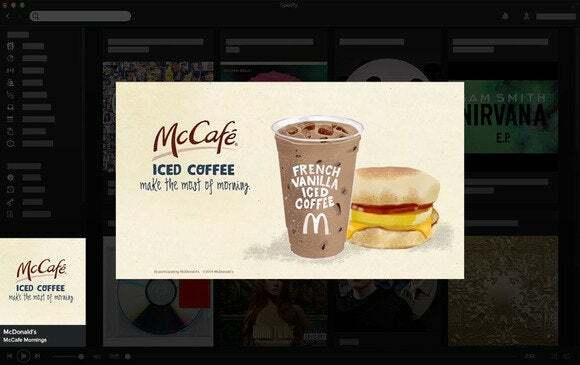 When it's time for an ad spot, instead of getting an audio-only commercial, non-subscribers will soon see video ads that pop-up and occupy the center of Spotify's app—the rest of the app will be dimmed. Based on a video demo on Spotify's site, you will be able to minimize the ads to the space where album art is usually displayed. That way you can continue to access Spotify while the ad is playing. Spotify says video ads will only happen when the app is in view. It's not clear if that means the app would have to have mouse focus before a video ad would appear. Ad-supported listening on Spotify's mobile apps will soon offer Sponsored Sessions. You won't see random video ads if you're rocking out on your iPhone, but you can get 30 minutes of ad-free music for watching an ad. With Spotify's Sponsored Sessions you'd hear an audio prompt to "take a break from the ads" by tapping a "watch now" button to see a video spot. The video ad would then start playing and after it's done you'll have 30 minutes of ad-free listening. That's what Spotify's demo of the new ad formats is showing right now. The interface and how video ads are served may change before launch. As these ads are on mobile, where display space is already constrained, all commercials are shown full screen in either landscape or portrait mode. For Spotify freeloaders, the notion of watching one video ad for half-an-hour of uninterrupted music should be appealing. And if you listen to Spotify at work, it might even be worth bringing a phone charger to the office and skip using the desktop app entirely.